READING TOGETHER "WHEN SINNERS SAY I DO"
I am so excited for you if you are a husband or wife who attends Faith Bible Church. If you do not, you can follow along over the next 10 weeks on what will be a great journey. This journey is through the book, “When Sinners Say I Do, Discovering the Power of the Gospel for Marriage.” I have read many and perhaps too many books on marriage. Some have been very useful. Most are filled with a worldly perspective that misses the biblical meaning of marriage. 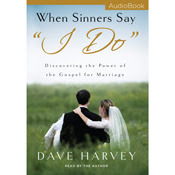 Then last year I picked up “When Sinners Say I Do” and it was not long into the book I cried out “FINALLY!” Pastor Dave Harvey gets it and expresses what marriage is all about and the hope we have to live a Christ-honoring, gospel-centered marriage. Dave Harvey states that the biggest problem for me and my marriage is found in Galatians 5:17, “For the desires of the flesh are against the Spirit, and the desires of the Spirit are against the flesh, for these are opposed to each other, to keep you from doing the things you want to do.” In other words, marriage is the union of two people who arrive toting the luggage of life. And that luggage always contains sin. The point of “When Sinners Say I Do” is not a depressing thought. It recognizes that to get to the heart of marriage, we must deal with the heart of sin. Thomas Watson once said, “till sin be bitter, Christ will not be sweet.” This is the profound truth of the gospel. Until we understand the problem, we will not delight in the solution. Grace is truly amazing because of what we were saved from. And now the special part. Due to the generosity of a couple who have found and continue to find the benefit of pursuing the gospel in their marriage, they have arranged that we can give a free copy of this book to each couple at Faith Bible Church who will commit to reading and discussing it among themselves over the next 10 weeks. I will introduce you to the book Sunday morning and we will give you your copy which the author Dave Harvey, in appreciation of what we are going to do, has personally signed. We will play a short video each Sunday before the worship service of Dave introducing the chapter and then I will post on this site discussion questions and application challenges. Join us for an adventure over the next 10 weeks that gives the potential for you and your marriage to be completely transformed by the power of God through the gospel of Jesus Christ.